• A box advertisement displayed on the side of every page of Horley Online, which clicks through to your website. 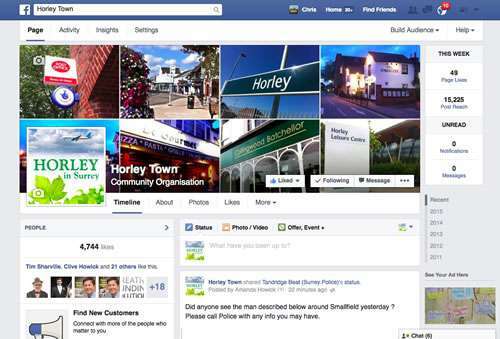 • Announcements about your business every month on Horley Town Facebook page. • Announcements about you every month on @horley_town Twitter feed. • Minimum period six months. • A large top banner displayed on every page which clicks through to your website (rotating with other Silver Package adverts). • Plus a box advertisement displayed on the side of every page of Horley Online which clicks through to your website. Opportunities to sponsor featured pages, competitions and articles are always available. Please contact the editor for individual prices and availability. We are always happy to promote local charity and community events for FREE. Call us or email your info and we will get back to you. We are always happy to promote local charity and community events for FREE. Please use our contact form and we will get back to you. Advertising rates are subject to 6 month minimum terms. All artwork to be provided by client. We can produce artwork for you but this is subject to additional costs, please contact editor for more details or call 01293 855216 now. The Horley Town Facebook page is followed by over 8000 local people, and this number grows every week. Go there now and join the local conversation. All our advertisers get FREE snippets. 'Snippets' are additional small ads and announcements that we place on Horley Town Facebook, on Twitter and in among the articles on the Horley Online pages. Your snippets are extras that will link through to your website or back to Horley Online giving an extra boost to your advertising. Contribute articles about your business, services or skills. As an advertiser you can contribute articles to Horley Online, giving you the opportunity to raise your profile even further. We tailor all advertising to suit your business and target audience. Call us now on 01342 842400 to discuss your marketing.